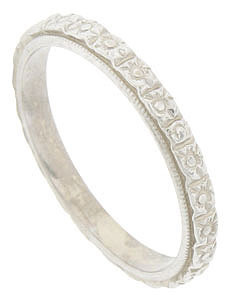 This 18K white gold antique style wedding band is crafted from the original antique ring. A romantic pattern of engraved blossoms framed in a delicate milgrain is engraved on the surface of the ring. The lovely band measures 2.33 mm in width. Size 5 3/4. We can re-size slightly or reorder in other sizes.